OPENS NOVEMBER 19! TICKETS ON SALE NOW! Charles Dickens' A Christmas Carol may well be the most influential story ever written about the winter holiday with its indelible characters and its universal message of kindness, compassion and generosity. Most of us know this literary masterpiece thanks to the many wonderful films that have been created and the theatrical productions that have become an annual part of the holiday celebration for many theater-lovers and their families. What you may not know is that in 1853, ten years after the story first appeared in print, Dickens himself decided to take the story on the road. He developed a one-man version of the story with himself as the venerable storyteller. Needless to say, his inaugural performance was an immediate hit, so much so that he performed A Christmas Carol 127 more times in both the U.K. and the U.S. until his death in 1870. 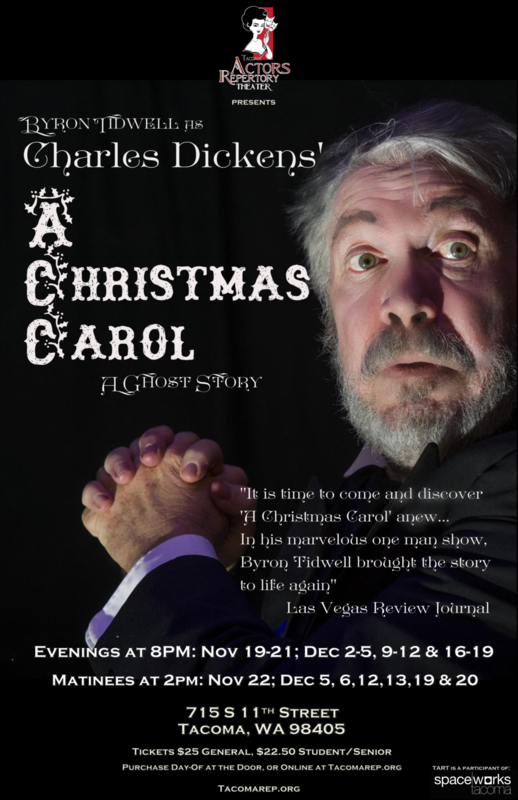 This year, the Tacoma Actors Repertory Theatre (TART) is thrilled to bring you this Dickensian treat as Dickens himself might have performed it. Simply staged and expertly performed by renowned character actor Byron Tidwell, A Christmas Carol: A Ghost Story will charm you with its humor, pathos, and warmth. Tidwell uses Dickens' own one-man script and his performance notes from his touring days. This is truly A Christmas Carol like you've never seen it before. A Christmas Carol: A Ghost Story plays November 19 through December 20. Click here for a detailed performance schedule. Click here to BUY TICKETS! Click here to learn more about Dickens' holiday classic. Byron Tidwell first performed the role of Charles Dickens with Tulsa Alliance for Classical Theatre in 1984. Critics at the time said, "Byron Tidwell brings the cracking vitality and detail to the challenge that Dickens himself did." Tidwell has continued to play the role to critical and audience acclaim. The TART performances of A Christmas Carol: A Ghost Story are part of a West Coast tour that also includes performances at California State University Palm Desert Campus. Tidwell's performance career has included extensive radio work from New York to L.A. (KUSC), His television appearances have been many, most notably as a guest on Chicago Hope. 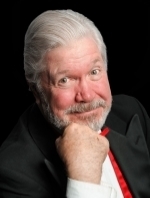 His theater work includes such leading roles as Tevye in Fiddler on the Roof, Mr. Bumble in Oliver!, Starbuck in The Rainmaker, Will Rogers in Will Rogers at Home (for the Will Rogers Memorial in Claremore, Oklahoma), and many others. He just completed playing all the male roles in Kindertransport for the Jewish Repertory Theatre of Nevada. He will reprise his role as Mr. Van Daan in The Diary of Anne Frank for that same company next spring. Living in Las Vegas, Tidwell also writes, directs video, performs as a Las Vegas Master of Ceremonies for nearly all of the major hotels and casinos, and tries in vain to maintain control over his menagerie that includes a Jack Russell Terrier, a Chiweenie, Fantail Pigeons, a fish pond, and a ginger kitty.